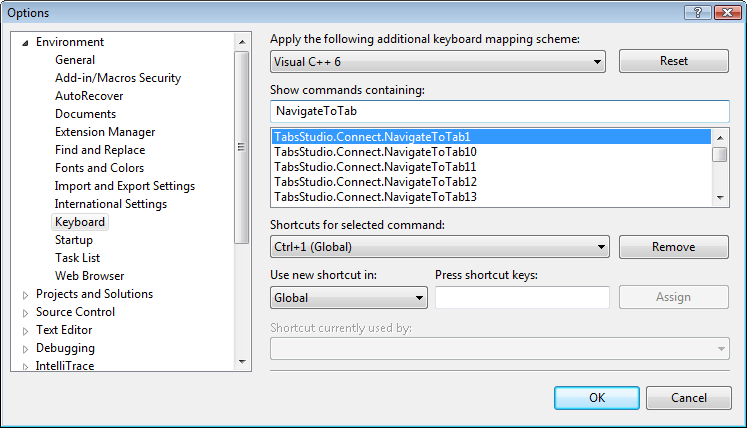 Navigator allows you to switch tabs using keyboard after assigning keyboard shortcuts in Visual Studio keyboard options. NavigateToNextWindow and NavigateToPreviousWindow commands first switch to the next document in the selected tab and then switch to the nearest document in the next tab. Use NavigateToNextGroup and NavigateToPreviousGroup to navigate between tab groups. 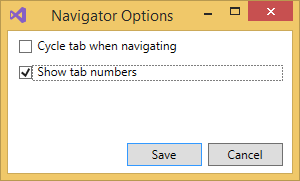 Use MoveTabLeft and MoveTabRight to reorder tabs. Note, to assign some shortcuts such as Ctrl+Shift+Right Arrow it needed to be in the Text Editor scope or default Text Editor command overrides it.